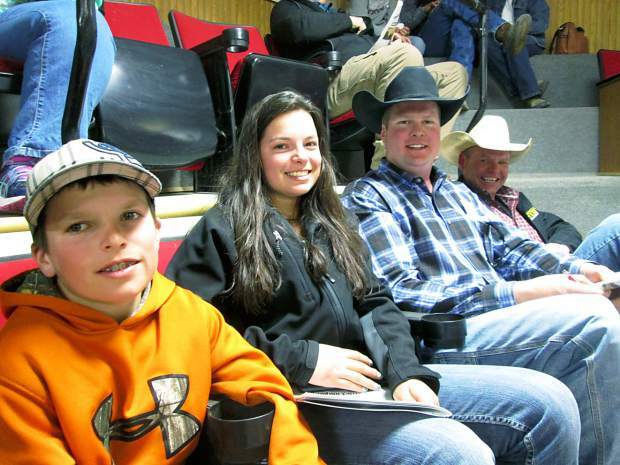 Adam and Bre Johnson with Sloan and Liam of Cody, Nebraska, bought three bulls. David Mason of Prairie Valley Charolais, Platte, South Dakota, bought the top selling bull. 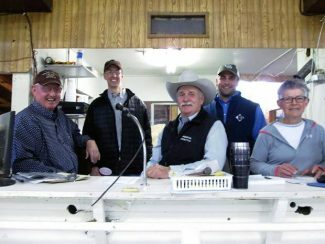 Schmidt Cattle Company from Gordon, Nebraska, hosted another large crowd for their annual bull sale, held at Sheridan Livestock in northwestern Nebraska. 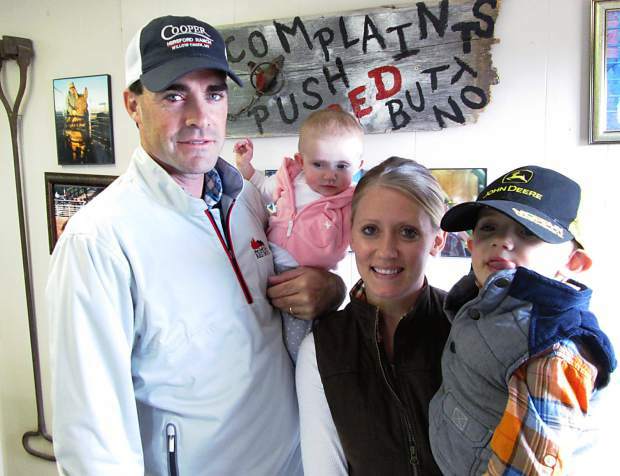 Randy and Marj Schmidt, along with their family, produce one of the top sets of Charolais cattle in the Midwest. Due to some bad weather forecasts, the sale had been postponed from Wednesday to the following Sunday. Schmidts focus their breeding goals on raising bulls that will sire quality, heavy calves for their feeder cattle customers. This was probably the deepest set of bulls that Schmidts have brought to town—more headcount, with even more quality. We were way into the sale, and there were still big, stout, thick bulls coming through the sale ring. Many repeat buyers were on the seats. 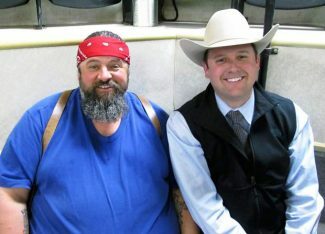 Randy has built a special loyalty to his customers. 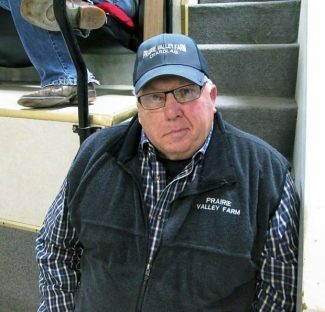 He purchased around 1,500 head of Charolais cross calves last fall, and many of them would have come from his bull customers. Top selling bull of the day was Lot 57, selling for $13,500 to repeat buyers, Kirk and Ellie Otte from Rushville, Nebraska. This bull was a son of WCR Sir Prince 9166P, and out of a Schurrtop bred cow. He weaned at 816 pounds, and reached 1354 pounds as a yearling. His 38 cm. scrotal measurement was complemented by EPDs of BW 1.2, WW 44, YW 82, MILK 19, and TM 41. Prairie Valley Charolais from Platte, South Dakota, chose a new herd prospect in Lot 181 at $13,000. Sired by Raile J827 A005, he was out of a PVF Cad bred dam. Born at 95 pounds, he weaned at 745 pounds, and grew o a yearling weight of 1441 pounds to ratio 111. His EPDs were BW 0.7, WW 37, YW 72, MILK 8, and TM 27. The JH Minor Company from Hyannis, Nebraska, bought Lot 23 at $13,000. Here was a son of LT Ledger 0332P who was out of a daughter of LT Silver Distance. Entering the world at 90 pounds, he weaned at 820 pounds to ratio 111. His yearling weight was 1372 pounds. EPDs for this good looking calf included BW -0.5, WW 39, YW 72, Milk 10, and TM 30. Ross Williams from Philip, South Dakota, chose Lot 69 at $10,000. Sired by WCR Sir Prince 9166P, he had an 85 pound birth weight and a weaning weight of 725 pounds. His EPDs were BW -0.5, WW 35, YW 66, MILK 14, and TM 32. Lot 161 was a son of 2TM Maximizer 22, and out of a daughter of WCR Sir Prince. He weaned at 784 pounds to ratio 110, and posted a yearling weight of 1405 to ratio 111. This good bull sold to Calvin Eisenbraun of Philip, South Dakota,for $9,750. Kirk Otte also selected Lot 56, a son of 2TM Maximizer 22. Born at 84 pounds, he weaned at 737 pounds and grew to a yearling weight of 1366 pounds. His EPDs were BW -0.9, WW 34, YW 53, and TM 25. He sold for $9,500.